Halloween, like Christmas and Easter, has so many mascots that kids can immediately recognize, but none of them are very friendly are they? I mean, Christmas has Santa, Easter has the Easter Bunny, but Halloween has witches, goblins, skeletons, Frankensteins and, in this case, the horrifying creature known only as Michael Meyers, the star of the recently revived Halloween franchise starring Jamie Lee Curtis. He’s a bit creepier than the witch or the cuddly vampire bat, especially to a child, so enter Jimmy Kimmel to do his best weird prank and, with the consent of the parents, invite kids in to meet… Michael Meyers. The results are incredible. The first kid is scared and reacts in a way that… feels about right. He knows Michael Meyers isn’t real, and the cameras probably hint that this is all a put on, but still! I imagine standing next to some leather faced creep isn’t the ideal way to spend your evening. The kid stares horrified into the camera, gets his photo taken and leaves. The next kid is very frightened as well, quietly entering, and not really wanting anything to do with it. Then a little girl turns around and just hugs Michael Meyers. Awww. Kids can be so sweet! I wouldn’t hug Michael Meyers, but that’s why this little girl is so great, am I right? 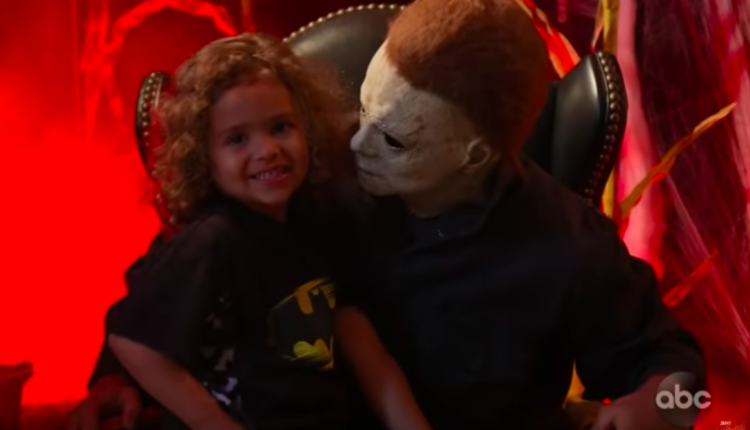 The last child to meet Michael Meyers in the video is pure, and her reaction is one that is emotionally honest. She takes on look at Michael Meyers, goes “Nope!” and turns around. Bless you, child with the correct reaction to seeing a monster. You will survive many a horror movie should big old creepy monsters decide to come your way for whatever reason. What do you think of this latest Jimmy Kimmel Live child pranking sketch? Let us know in the comments or on Twitter at @WhatsTrending.